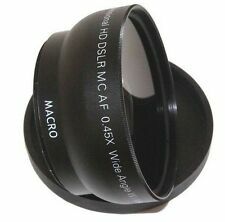 Pro Wide Angle Lens with Macro for Sony HDR-CX7 DCR-SR200. This is a 0.43x Pro HD wide angle lens with MACRO. Macro Lens. Wide Angle Lens. Lens Covers. Digital Multi Coated Lens. Professional High Definition: PHD lens reduces glass flare and ghosting causes by reflections. High Definition AF Wide Angle Lens with Macro For Sony HDR-CX580 HDR-PJ580. Pro Series 0.43x Wide Angle Lens with Macro. Macro adapter for close up photography. Pro Series 0.43x HD Lens. Front Lens Cover. Series Konica Minolta. Mount Sony Alpha. I would rate lens at 8 ( or excellent condition ) out of 10. Lens has been used, it has scratches on the plastic parts. Focal Length Type Zoom. Rear cap is missing. 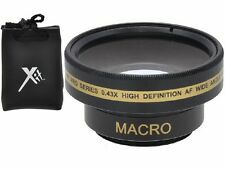 High Definition AF Wide Angle Lens with Macro forSony HXR-NX30U. Pro Series 0.43x Wide Angle Lens with Macro. Macro adapter for close up photography. Pro Series 0.43x Wide Angle Lens, Capture the Spot. Vivitar HD4 Optics 0.43x Wide Angle Lens for Nikon D3100 and D3200. Vivitar HD4 Optics Wide Angle Lens with Macro & Ring adapter. Vivitar, HD4 Optics, Anti Reflection Coating. Pro HD Wide Angle with Macro Lens. Pro Hi Definition Wide Angle Lens with Macro for Sony HDR-CX760V Camcorder. Macro Lens with Wide Angle Lens. This is a 0.45x Pro HD wide angle lens with MACRO. Wide Angle Lens. Front & Back Lens Covers. Macro Lens with Wide Angle Lens. This is a 0.43x Pro HD wide angle lens with MACRO. This lens is for Sony 18-55mm lens or any other lens that takes 55mm filter. Wide Angle Lens. Front & Back Lens Covers. Vivitar HD4 Optics 0.43x Wide Angle Lens for Sony HDR-CX430V, HDR-PJ650V, HDR-PJ430V. Vivitar HD4 Optics Wide Angle Lens with Macro & Ring adapter. Vivitar, HD4 Optics, Anti Reflection Coating. Pro HD Wide Angle with Macro Lens. 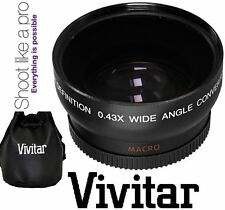 Vivitar HD4 Optics 0.43x Wide Angle Lens for Sony SLT-A35K. Vivitar HD4 Optics Wide Angle Lens with Macro & Ring adapter. Vivitar, HD4 Optics, Anti Reflection Coating. Pro HD Wide Angle with Macro Lens. Macro Lens with Wide Angle Lens. This is a 0.45x Pro HD wide angle lens with MACRO. This lens is for Sony 18-55mm lens or any other lens that takes 55mm filter. Wide Angle Lens. Front & Back Lens Covers. Pro HD 0.45x Wide Angle Lens with Macro. HD 0.45x Wide Angle Lens With Macro. For Sony HDR-AX2000. Front Lens Cover. Back Lens Cover. Professional High Definition: PHD lens reduces glass flare and ghosting causes by reflections. This is a 0.43x Pro HD wide angle lens with MACRO. Wide Angle Lens Wide Angle Lens. Macro Lens. Lens Covers. Digital Multi Coated Lens. Professional High Definition: PHD lens reduces glass flare and ghosting causes by reflections. Vivitar HD 0.43x Wide Angle Lens with Macro Lens. For Sony HVR-HD1000U HVR-HD1000. Front Lens Covers. Back Lens Covers. Professional High Definition: PHD lens reduces glass flare and ghosting causes by reflections. HD 0.43x Wide Angle Lens with Macro Lens. Front Lens Covers. Professional High Definition: PHD lens reduces glass flare and ghosting causes by reflections. Back Lens Covers. Type Wide Angle. Focal Length Fixed. 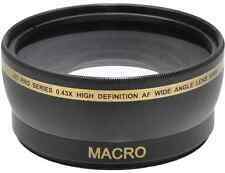 Pro Hi Definition Wide Angle Lens with Macro for Sony. This is a 0.43x Pro HD wide angle lens with MACRO. Macro Lens. Wide Angle Lens. Front & Back Lens Covers. Digital Multi Coated Lens. Professional High Definition: PHD lens reduces glass flare and ghosting causes by reflections. Autofocus: Yes. Focal Length: 35mm. LCF-67 III 67mm Lens Cap. Rear Cap LCR II for Sony E Mount Lenses. LH730-03 Lens Hood. Product detail. We are willing to solve any problems. We make it more long-lasting. 1 x Sony FE 16-35mm f/2.8 GM Lens SEL1635GM. Nano AR Coating and Fluorine Coating. Autofocus Yes. Focal Length 16 - 35mm. 1 x ALC-SH149 Lens Hood. 1 x ALC-F82S 82mm Front Lens Cap. 1 x ALC-R1EM Rear Lens Cap. Compatible with Sigma USB Dock. Autofocus Yes. Focal Length 24mm. 1 x LCR III 77mm Front Lens Cap. 1 x LCR II Rear Lens Cap. 1 x LH830-03 Petal Type Lens Hood. Product Image. Product Heightlights . Focal length : 18mm - 200mm. Aperture : F3.5 - 6.3 - F22. We make it more long-lasting The actual appearance of the products may be a little bit different from the photos shown. It's all up to your preference of when and where you want. 1 x Samyang AF 24mm f/2.8 FE Lens for Sony E. Autofocus with Manual Focus Override. Autofocus Yes. Focal Length 24mm. 1 x Lens HoodProduct Heightlights And all products must be sent back to US for warranty. Front Lens Cap, Rear Lens Cap. We will work with you until you are satisfied. We are willing to solve any problems. We ourselves take care of your worries. We make it more long-lasting Ready to send back for a repair?. 1 x Sony E PZ 18-105mm f/4 G OSS Lens (Black). Focal Length 18 - 105mm. Autofocus Yes. Sony E-Mount. 1 x ALC-SH128 Lens HoodProduct Heightlights 3.07 x 4.33" (78 x 110 mm). Comparable 35mm Focal Length: 27 - 158 mm. 1 x Sony FE 16-35mm f/2.8 GM Lens SEL1635GM. Nano AR Coating and Fluorine Coating. Autofocus Yes. 1 x ALC-SH149 Lens Hood. Focal Length 16 - 35mm. 1 x ALC-F82S 82mm Front Lens Cap. 1 x ALC-R1EM Rear Lens Cap. 1 x Sony Vario-Tessar T FE 24-70mm f/4 ZA OSS Lens. Autofocus Yes. Focal Length 24 - 70mm. 1 x Lens Hood. 1 x Lens CaseProduct Heightlights Minimum Focus Distance 1.31` (40 cm). Any product, which the serial number has been defaced, modified or removed. 1 x Sony 10-18mm f/4 OSS Alpha E-mount Wide-Angle Zoom Lens. With an aperture of f/4.0 throughout the zoom range, fast shutter speeds and low ISO settings can be used even in low light for bright, sharp images. Aperture : F2.8. Focal length : 16mm. Lens mount : Sony E(NEX). we make it unprecedented. Isn't it too easy?. Weight : 74g(0.16lb). We are willing to solve any problems. Ready to send back for a repair?. Autofocus Yes. 1 x R1EM Rear Lens Cap for Select Alpha NEX E-Mount Lenses (Dark Gray)Product Heightlights Focal Length 35mm. 1 x Lens Case. 1 x ALC-SH137 Lens Hood. 1 x ALC-F72S 72mm Front Lens Cap. Autofocus (AF) & Manual Focus (MF). Autofocus Yes. Focal Length 16mm. 1 x Front Lens Cap. 1 x Rear Lens CapProduct Heightlights Pancake Style Lens - 0.8"/22mm Long. What the warranty does not cover. Autofocus Yes. Clothes & Accessories. 1 x R1EM Rear Lens Cap for Select Alpha NEX E-Mount Lenses (Dark Gray)Product Heightlights Kids' Clothes, Shoes & Accs. 1 x ALC-SH137 Lens Hood. 1 x Lens Case. Product Highlights E-Mount Lens/Full-Frame Format Aperture Range: f/2.8 to f/22 Two Extra-Low Dispersion Elements Three Aspherical and Two XA Elements Nano AR Coating and Fluorine Coating Direct Drive Super Sonic Wave AF Motors Focus Hold Button; AF/MF Switch Dust and Moisture-Resistant Construction Eleven-Blade Circular Diaphragm . Sony E 20mm f/2.8 Wide Angle LensSKU: SEL20F28. Lens Category Landscape. View Finder. Image Processor. AF Working Range. Tilt Screen. Focus Range. Low Pass Filter. Constant F4 maximum aperture throughout the zoom range. So it's not unopened but we seal it in the original box. Ideal for architecture, landscape, and interior photography, this lens' 82° angle of view pairs with a 7.9" minimum focusing distance for producing creative perspectives and unique close-up imagery. CARL ZEISS. Milvus 135mm f/2 ZE Lens for Canon EF. An enhanced Zeiss T anti-reflective coating has also been applied to significantly reduce ghosting and lens flare for improved contrast and color fidelity when working in difficult lighting conditions. Milvus 18mm f/2.8 ZE Lens for Canon EF. CARL ZEISS. Zeiss T Anti-Reflective Coating. Our warranty covers labour costs for repairing the faulty unit. Format Compatibility. Minimum: f/22. Maximum: f/2.8. Lens made in Japan. Lens has Minolta Maxxum AF (Sony A mount) mount. For sale is Used Minolta Maxxum 35-80mm f4-5.6 AF Power zoom Lens (SN 16228351) in good condition. Series Minolta Maxxum. All lens features work good. 0.43x wide angle lens with Macro. Front lens thread size: 62mm. Front and back lens covers & Ring adapter. Two (2) lens pouches. Professional high definition lens reduces glass flare & ghosting caused by reflections. Series Konica Minolta Maxxum. Product Line Konica Minolta Maxxum. Mount Minolta A-type. Model 70-210mm F4.5-5.6 AF. Lens has been used but is in very good condition. Lens looks very nice. Glass does not have any scratches. Condition: Refurbished By Minolta. 35-80mm f4 to f5.6 zoom lens. Series Minolta Maxxum. Focal Length Type Zoom. Type Wide Angle. We will do our best to resolve any issues. We will respond within 24 hours. Vivitar HD 0.43x Wide Angle Lens With Macro. is for Sony SEL50F18Lens or any other lens that has 49mm Filter Thread. Front Lens Cover. Back Lens Cover. Professional High Definition: PHD lens reduces glass flare and ghosting causes by reflections. Series Minolta Maxxum. 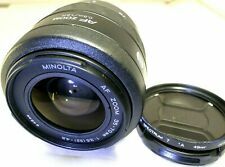 For sale is Used Minolta AF zoom 35-80mm f4-5.6 Lens (SN 52909676) in good condition. Lens made in Japan. Lens looks very nice. No scratches. It shows light if any wear on exterior. Series Konica Minolta Maxxum. Product Line Konica Minolta Maxxum. Mount Sony Alpha. I would rate lens at 8 ( or excellent condition ) out of 10. Lens has been used, it has scratches on the plastic parts. SN 95210195. Lens made in Japan. Series Minolta Maxxum. Mount Minolta A-type. Lens has been used but is in very good condition. Lens looks very nice. It shows light if any wear on exterior. I don't see any scratches or scuffs on the lenses front coating.